When it comes to theme parks, there is little that I don’t love! 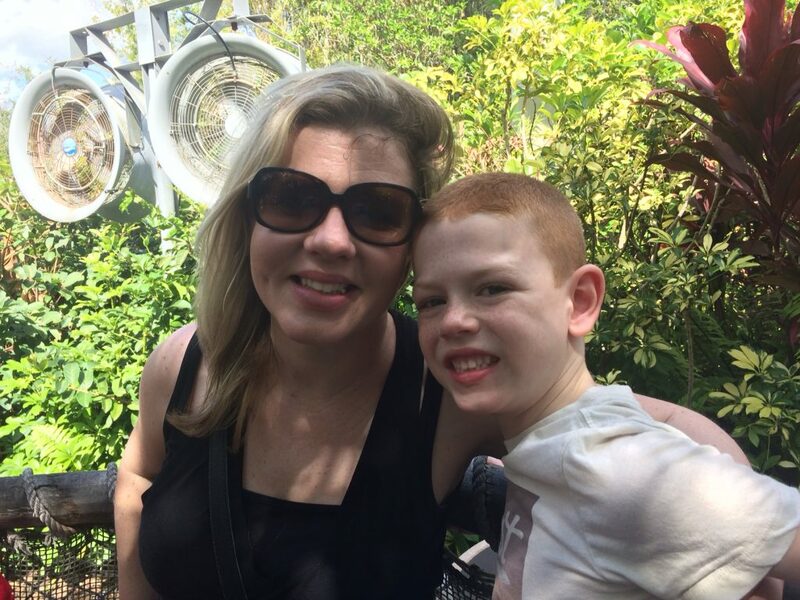 Give me a roller coaster, popcorn and churros, some hot sun, and lots of games and I am one happy mom! 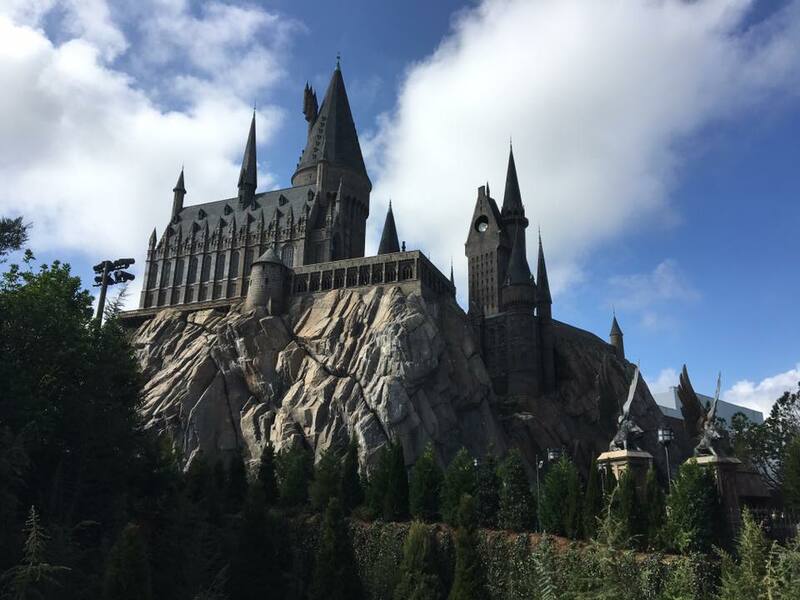 Universal Orlando has been on my “must visit” list for well over 10 years… and I am so excited to say that it did not disappoint. In fact, it so far exceeded my expectations that I have not stopped raving about our experience to pretty much everyone I meet. Now, the truth about me is that I am not a planner. I always wing it when I am visiting somewhere new because I like to just “be” in a place and not have pre-conceived expectations or “must-dos” on my list that will leave me disappointed if we don’t get to them. However, after visiting Universal, I realized that a little pre-planning (or even just some pre-knowledge) is totally necessary. Why? Universal Orlando is BIG! There is so much to see and do that it can feel a bit overwhelming and you need to have an idea of where to begin in order to really enjoy it all. 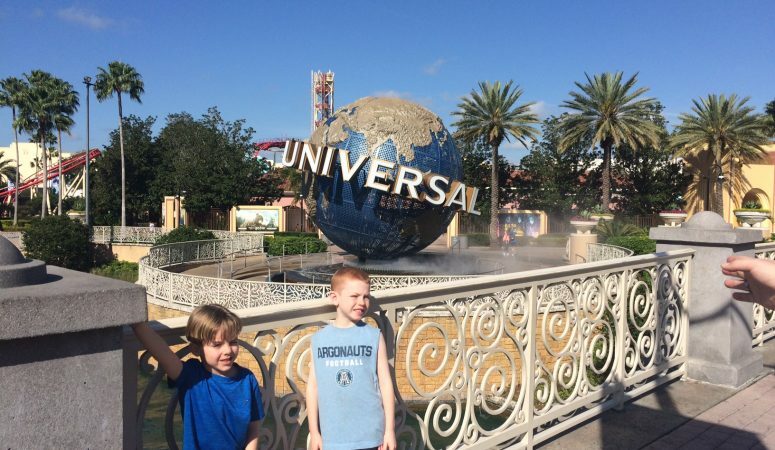 Before you make it to Universal, there are a few things you should be ready for. I strongly advise purchasing the “Park-to-Park” ticket option. Yes, it will cost you a little more but Universal Orlando is made up of two parks that are equally as good. In fact, one of the best part of Universal is the Harry Potter train that connects the two parks to each other – that ride alone is worth the “Park-to-Park” ticket price! If possible, purchase online and pick up your tickets at the park (there are kiosks right near the entrance). Although we were not at the park on a particularly busy day, there was still a long line-up for tickets at the entrance that could easily add an additional hour wait. So not worth it! There are plenty of add-ons that you can include in your ticket price. Again, if you can swing the price, I would strongly suggest adding the “Universal Express Unlimited” to your tickets. When Universal is busy, you can find yourself waiting in line for well over an hour (for a 5 minute ride). That is an exercise in massive frustration if you’re there with kids. I do not like to be slowed down when I’m having fun, so the Express pass was worth it for my entire family. *It is important to note that a handful of rides do not allow for use of the Express pass (including the Harry Potter “Hogwarts Express” train that connects the two parks and a few of the rides for younger children). It still was well worth the money, however, as the wait for Kong was over an hour! Although we did not purchase with our ticket, the Dining Package (without the souvenir cup) would have saved us about 30% on food. You can certainly bring in your own food, but lugging it around all day is difficult – especially if you plan to be on the rides. The park has lots of food options (more on that later) that are part of the fun! Buying your Dining Package ahe ad of time just takes the worry out of packing or paying for food! 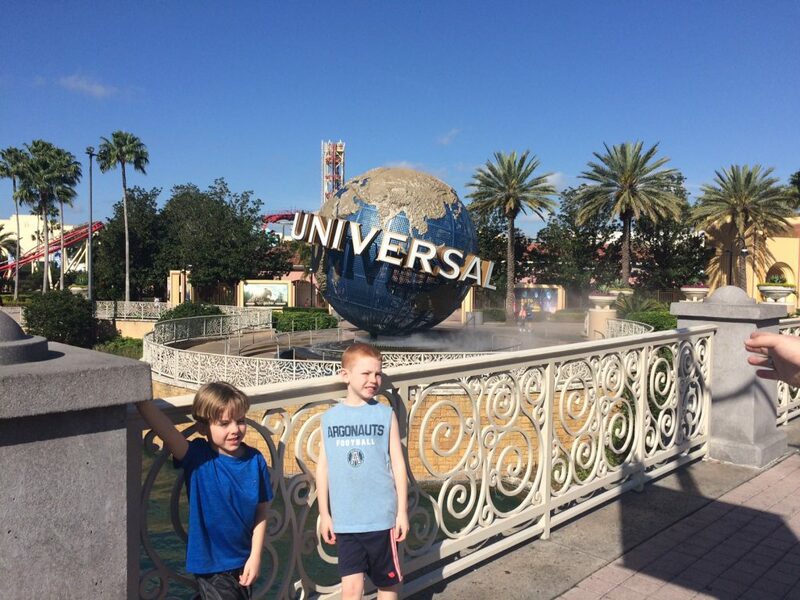 Universal Orlando certainly has some attractions for younger children, but it strongly skews toward children 6 years old and up, simply because of the height restrictions on so many of the rides. Check out the height requirements before booking your trip and prepare your children for not being able to ride every single ride that’s there:) (For the record, we completely prepared our 5 year old for not being able to ride every ride, and in the end there were only 3 rides he wanted to go on that he couldn’t. He’s our ride fanatic, so it was good that we prepared him early!). 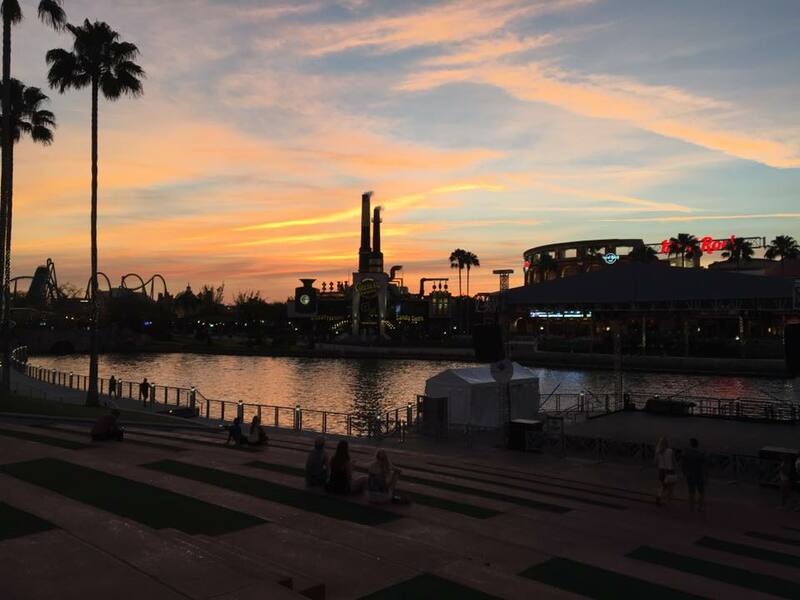 Before you can even make it to the park(s), you get to wander through Universal CityWalk – a complete “city” in and of itself, full of amazing restaurants, games, stores and so much more! If you have the time, I would make a reservation at one of the amazing restaurants here (I was jonesing for Antojitos Authentic Mexican Food but we just didn’t have the time). Bonus: if you just want to eat here, there is free self-parking after 6:00pm and there is no charge to hang out at Universal CityWalk! 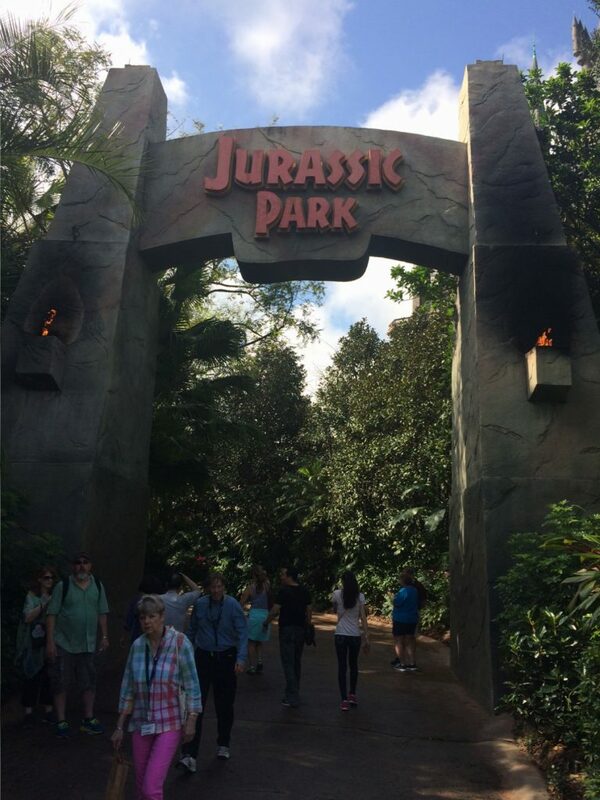 This is the park your one-day adventure should begin at! Arrive as early as you can (check the park hours here) to beat the crowds and get in as much fun as you can squish into one day! Both parks are divided into “sections” that make it easy to get in all the good rides! The first ride you should conquer is Despicable Me Minion Mayhem, followed by Shrek 4-D and Transformers: The 3D ride. 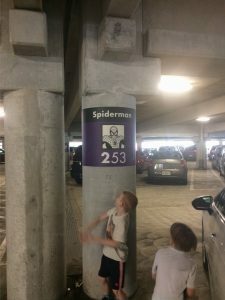 They are all within a 2 minute walk of each other and (my entire family agreed) some of our favourite rides at Universal! You’ll laugh your head off during Despicable Me (as you’re turned into a Minion!) and feel ridiculously powerful as you help out your favourite Transformers protect mankind. RELATED POST: Are Your Kids Missing School? Move on to Revenge of the Mummy (check the height requirements – my 7 year old found this to be the scariest ride at Universal, bar none!) and then make your way to the Wizarding World of Harry Potter – Diagon Alley! (hint: it’s hidden behind some huge walls directly across from a pretty popular triple decker bus!). We are not huge Harry Potter fans but the magic that is created in this world is beyond anything I have ever experienced. 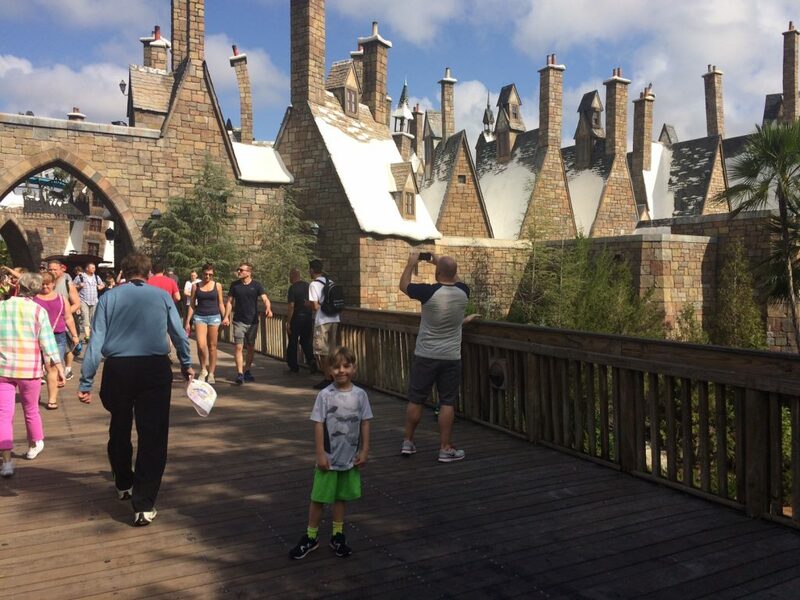 Get to the Harry Potter attractions as early as you can (before 10am is optimal) because it get so busy! Take the time to walk around and simply soak in the magic – that’s the only way I can describe this world: MAGICAL. If you are a huge Harry Potter fan, you may want to purchase you own magical wand and unlock the hidden gems that lay throughout this wizarding world. (If you’re not a huge fan, or want to save the cash, observe others like I did…totally worth it!). This is a good time to grab lunch at The Hopping Pot. Try to get there before noon to avoid the massive crowds! When you’re done, it’s time to take the Hogwarts Express train over to Universal’s Island of Adventure park! *remember, you’ll need the Park-to-Park ticket to ride the train! **You’ll be coming back to this park so don’t fret that you’ve missed a few rides! As soon as you enter the Hogwarts Express train station you are transported to a different place and time. I really have never experienced something quite so magical! You’ll be guided to board the train in cars that seat 8 and you’ll set off on a journey unlike any other I have been on before (if you really want the most out of this, can I suggest that you watch the Harry Potter movies BEFORE your trip to Universal? It will all make so much more sense!). The train drops you off at Hogmeade, where I suggest you quickly make your way to Harry Potter and the Forbidden Journey! Even if you cannot handle the ride (you will get jostled around a lot) or your child is too short to ride, simply walking through the castle is a sight to behold – at every turn you encounter something more magical than before! When you’re finished, you have to ride Flight of the Hippogriff. 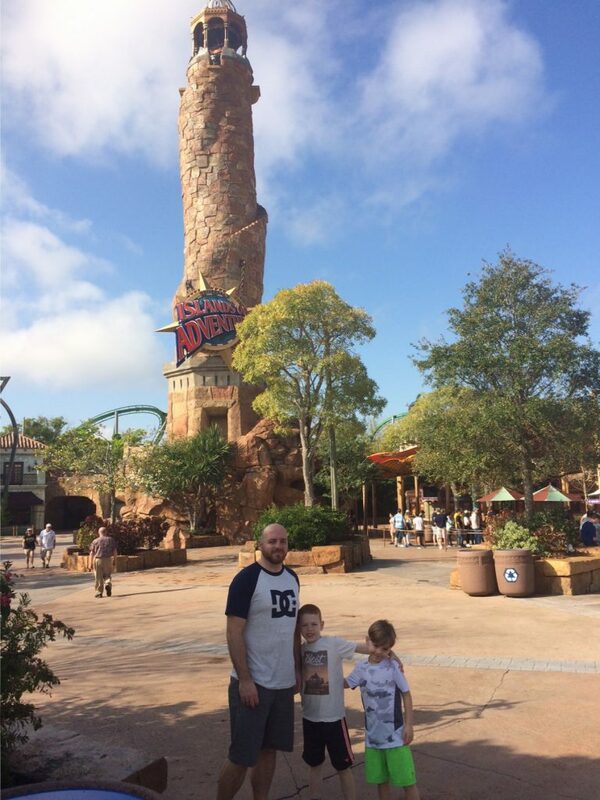 This was my youngest son’s favourite ride – we rode it 10 times…no joke! It’s fast, it’s fun, and your kiddos will have their hands up in the air shrieking with delight! 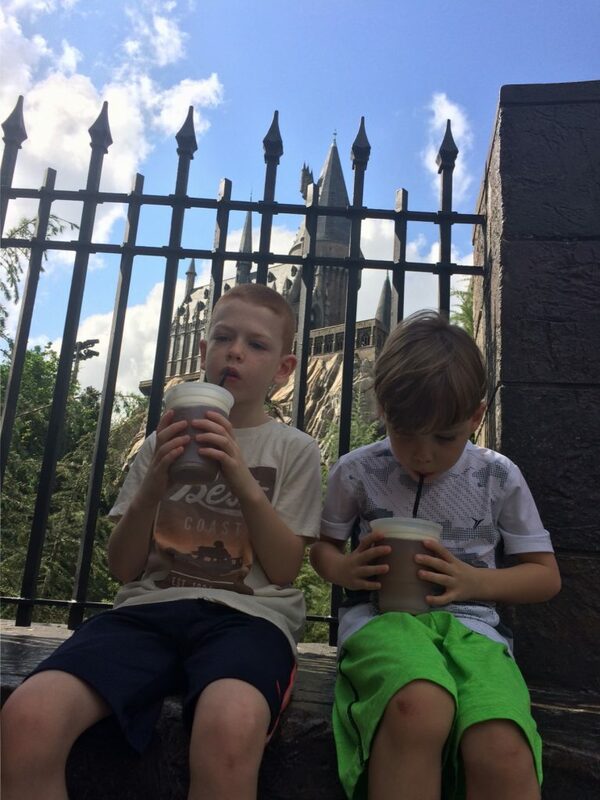 Grab a Butter Beer (get the frozen ones!) 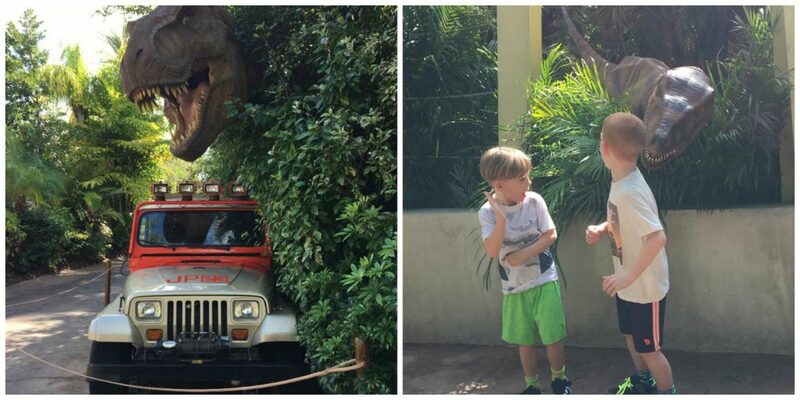 and get ready to head out to Jurassic Park! We have a little budding palaeontologist on our hands, so Jurassic Park was true heaven for him! Sadly the Jurassic Park River Adventure was shut down for improvement while we were visiting but the Pteranodon Flyers (no Express pass), Camp Jurassic and the Discovery Centre were all MASSIVE hits! The Discovery Centre was an especially nice break from the heat and gave the kids a chance to slow down a bit while hatching a dino egg and discovering new species. My eldest chose a Raptor claw as his “memory gift” (each of our kids gets to choose one item when we are on vacation to take home as a souvenir). If you have a chance, take the time to meet a real Raptor…just beware that they bite! LOL (actually, one kid in line – not mine – was really scared and ended up bawling his eyes, so make sure you encourage your kids with the knowledge that the Raptor is not real!). From here, you’ll want to move on to Skull Island and experience my personal favourite ride: REIGN OF KONG. My husband had to actually convince me to get on this one (I had heard it was scary) but I’m so glad he did because it was so well done! It is intimidating for younger kids, but my 5 year old loved it so much that he ended up choosing a Kong stuffy as his “memory gift” and ended up riding it 4 times! After you have ridden Kong a million times (just me? 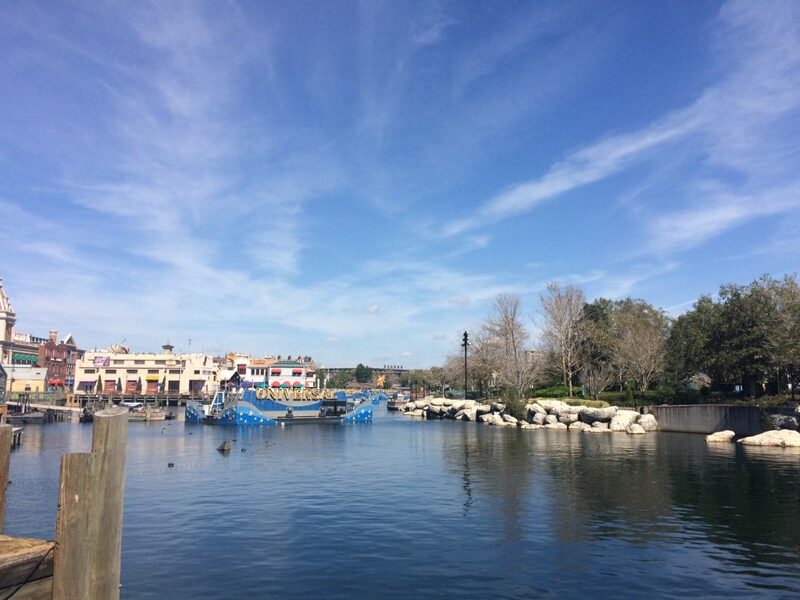 ), take a stroll through Toon Lagoon. If you’re interested in getting soaked you’re in the right place – and I mean SOAKED! If you’re like me, however, and want to skip the water, just enjoy the colourful, cartoon fun in this “world” and keep on walking to “Marvel Superhero Island“! 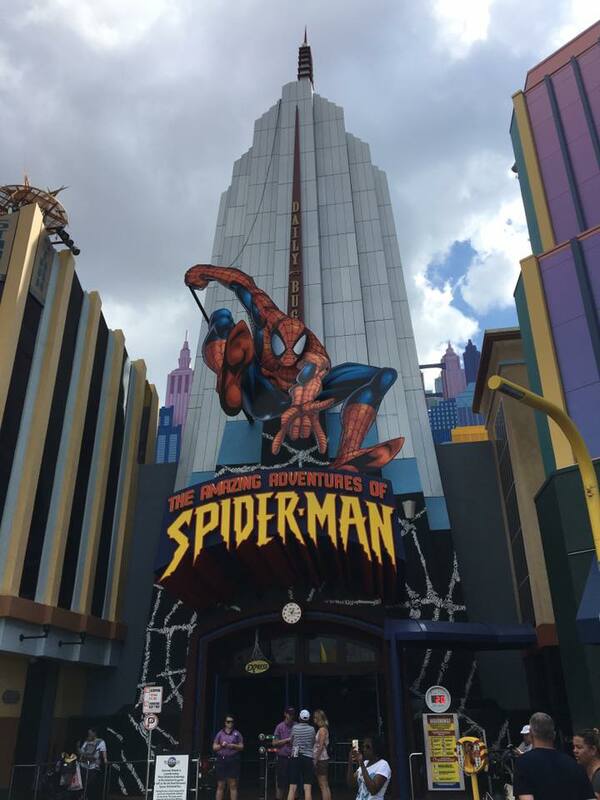 No trip to Universal Orlando would be complete without experiencing The Amazing Adventures of Spiderman. This was another ride we could have rode all day – it’s interactive and fun for kids and kids at heart. Get ready to feel like you’re flying from building to building with Spiderman, and free-falling as you try to escape from Doc Ock. [I felt like this was one of the most realistic rides at Universal – you feel the fire, the water, the swinging and the falling as if you are experiencing it in real life.] If you are not traveling with young kids, and you’re a bit of a daredevil!, this is where you’ll find Doctor Doom’s Fearfall and The Incredible Hulk Coaster – both scream-inducing rides for the not-so-faint of heart! Stop in for a bite at the Captain America Diner (milkshakes for everyone! ), and use this time as an opportunity to recharge before finishing off the last leg of your day! 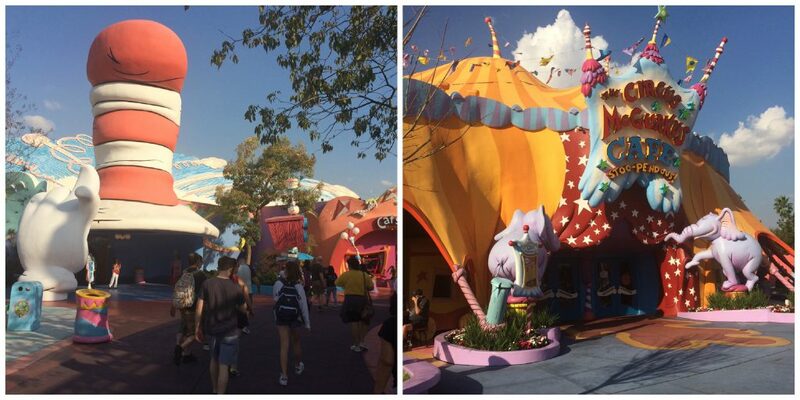 If you have young children, Suess Landing is your next stop – we were all amazed at how transported we felt while wandering through – but I wouldn’t highly recommend the rides for children any older than 7 years old. Instead, move on to The Lost Continent and take in the wonder of Poseiden’s Fury. 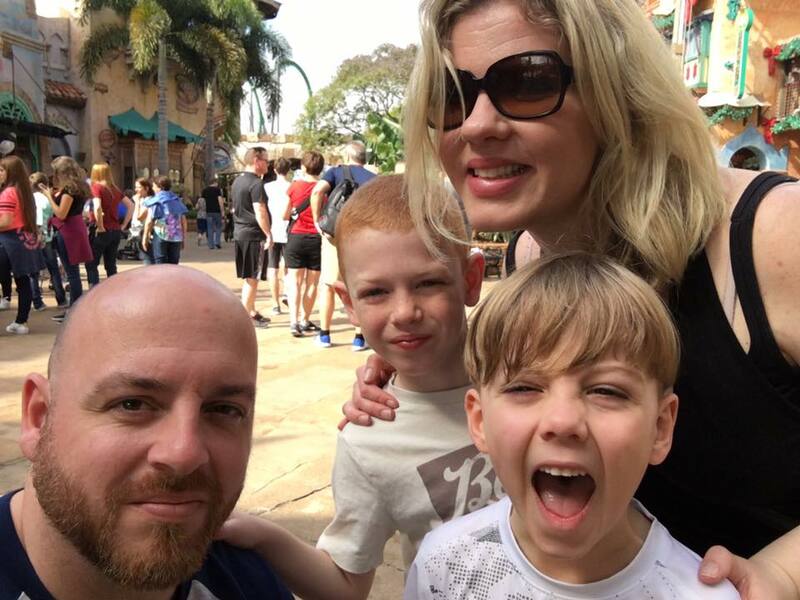 It wasn’t our favourite ride (actually, it’s a guided tour – not a ride) but experiencing the opulence of Poseiden’s lost world is totally worth a wait in line! 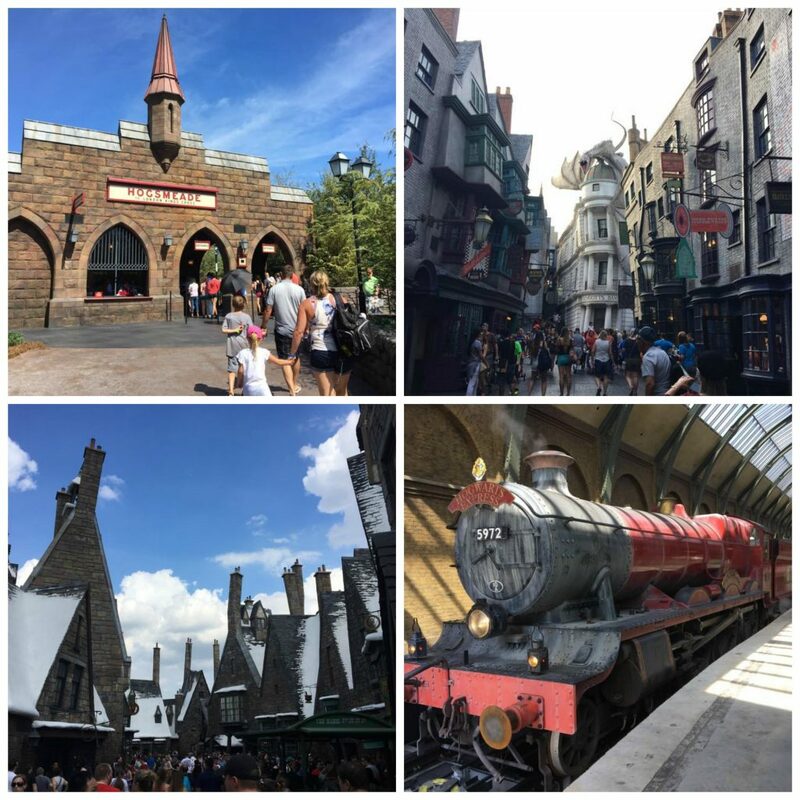 I know you will love all of Universal’s Islands of Adventure as much as my entire family did, but you need to get back into Hogsmeade and re-board the train to finish off your day right! Once you’ve de-boarded the train, you’ll find yourself back in the original Universal. You cannot miss out on the Men in Black: Alien Attack ride – I realize that if you’re there with kids they will have no clue what Men in Black is, but the fact that they get to shoot aliens (with a laser gun!) as they’re spun around in a moving car will solve any issue pretty quickly! And while I don’t want to toot my own horn, I think it’s really important to mention that I had the highest “alien kill” score of anyone in my family #justsaying. 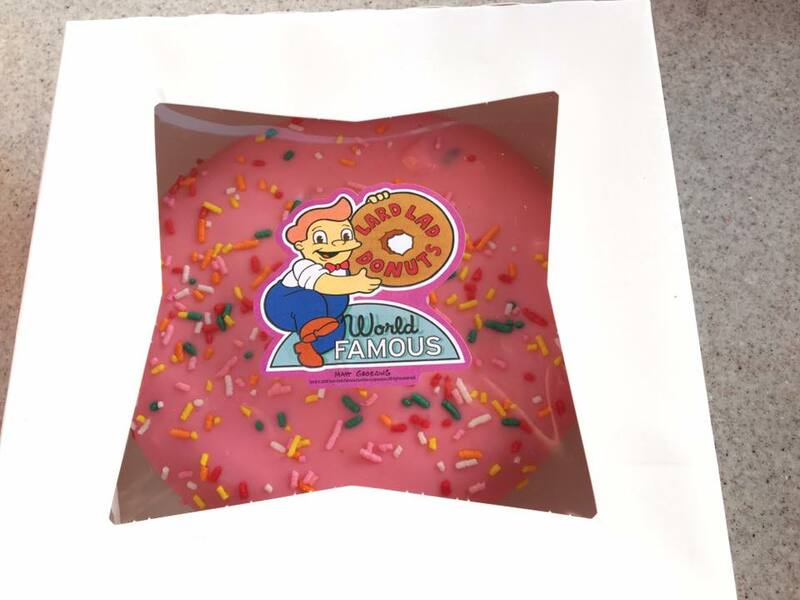 In truth, Springfield has the best food that we found at Universal, so if you happen to be jonesing for some sustenance, this is the place to be! 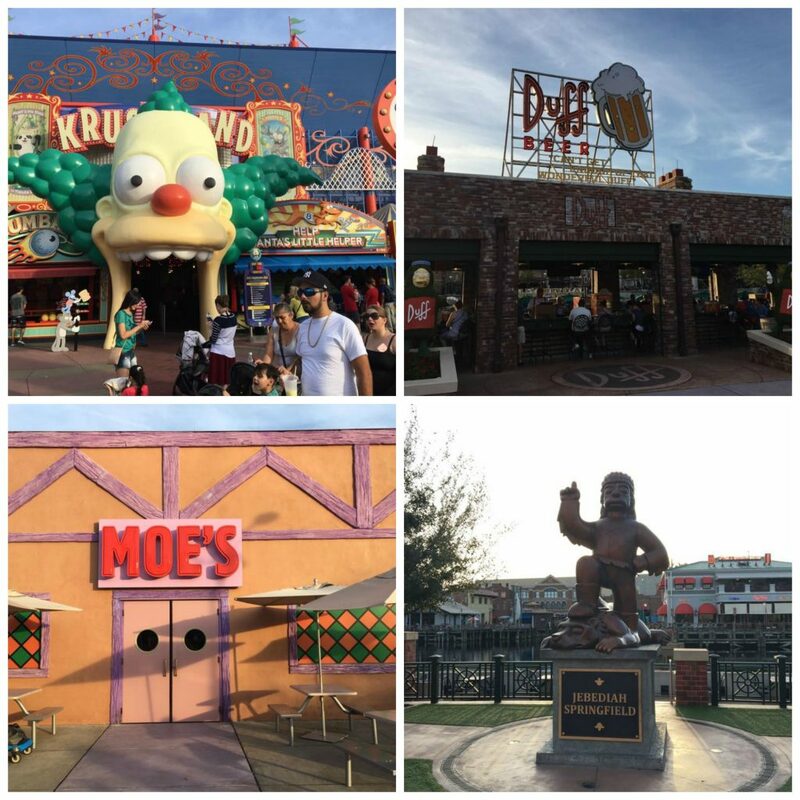 A stroll through Woody Woodpecker’s Kidzone (only stop if you have young kids with you) and perhaps one last ride on the Minions (you have to walk right by it anyway!) is the perfect way to end an EPIC day at Universal Orlando. You’ll be exhausted, but the memories will last forever! The food inside Universal Orlando is find but maybe not a “gourmet” experience – if you’re really looking for amazing food leave the park early and grab a bit on CityWalk. Each restaurant serves very similar food (burgers, fries, chicken) within the park. You can walk around Universal with a beer (this was very very very crucial information for parents!). There is little shade throughout both parks – make sure you are chugging water and stopping at the “misting” stations throughout the park. Carry the least amount of items possible – we saw many people struggling with backpacks when they wanted to have fun on the rides. We settled on one small purse (that I carried across my body). Bring sunscreen sticks! They’re small and fit in a purse or pocket for quick re-application throughout the day! The washrooms are extremely clean! I especially liked the washrooms in Hogsmeade. The staff is very friendly and very helpful! I had a great experience with guest services and staff around the park. You just won’t see it all – that’s a given – but focus on spending some time in each “world” to get a taste of it. Plenty of the rides are repetitive so get a good taste of everything you can but don’t feel bad about missing a few of the rides that I mentioned. 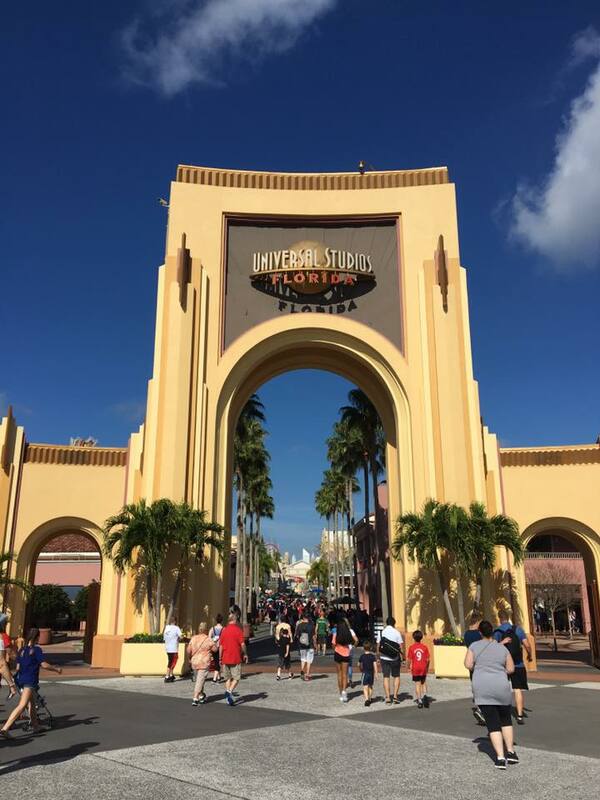 Each section of Universal really lives up to your expectations and completely transporst you to a different world – from the foliage to the music playing to the staff dress – it is amazing! There is a daily parade at Universal Florida – we missed it, sadly, but a family we met in line said it was a lot of fun! Arrive at the park as soon as it opens! The earlier you arrive the better (it gets very busy, very early!). Don’t bother to bring your “fancy” camera – use your phone and give yourself the chance to really enjoy the experience! Download park maps before you arrive so that you have a clear idea of where you want to go and what the lay of the land is truly like! 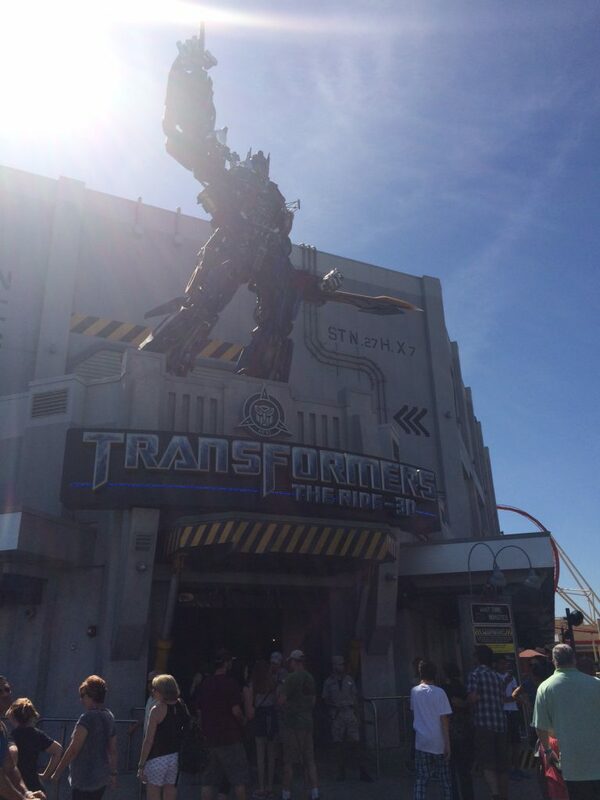 Disclaimer: We were given complimentary entry and Express passes from Universal Orlando for this trip. All other purchases – including food, accommodations, and travel – were made at our own cost. All opinions and experiences are truthful and my own. Wow! Sounds like you packed a lot in!! What a great experience! I can’t believe you rode Kong so many times!! My kids liked the ride but were so freaked out about the que!! HA!